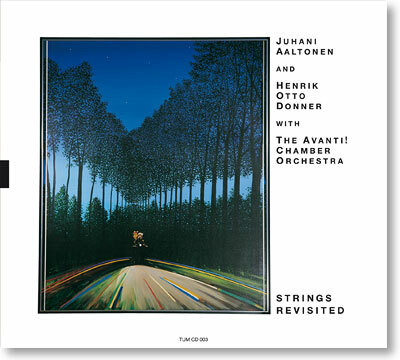 Strings Revisited revives and revamps the sound of Strings, a now-classic recording of Henrik Otto Donner´s compositions by tenor saxophonist/flautist Juhani Aaltonen together with a jazz group and strings that was originally released in 1976 and has become one of the cornerstones of modern Finnish jazz. Strings Revisited was born from the idea of building on the music of the original album in order to create new music. Three compositions from it were recorded as new contemporary arrangements and, in addition, Henrik Otto Donner created three totally new compositions for tenor saxophone and strings. Only very few recording in the history of jazz have combined improvisation with the lush sound of a string ensemble in such a contemporary manner as this recording and its predecessor. Besides Juhani Aaltonen, Strings Revisited also features jazz legends Reggie Workman on bass and Andrew Cyrille on drums and the Avanti! Chamber Orchestra, a highly acclaimed modern string ensemble here conducted by the composer Henrik Otto Donner. Juhani Aaltonen & Henrik Otto Donner with Avanti!